The name Natalie means “the source of inspiration and the enjoyment of life!” So it’s the perfect name for this well-planned home that’s all about enjoyment and invites every bit if your decorating inspiration! Then… step into the heart of the home…a fabulous family area, a breakfast room and a wonderful kitchen. There’s room here for not only YOUR family, but a few other families as well! Two more bedrooms and a bath, plus a separate laundry room are located in another wing of the Natalie…where everything is sensibly and perfectly placed for convenience and charm! Ahh-h…but there’s more! There’s a fourth bedroom that can become a study or office…a library…a music room! Almost secluded from the rest of the home, it’s perfect no matter how you use it…and it’s walk-in closet can easily become a bathroom if an elderly parent comes to stay. 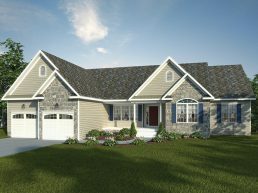 Last, but not least: The Natalie is built with an attached two car garage AND a full, unfinished basement ready whenever you are, for whatever you need it to be! J.A. Myers invites you to be inspired by your own enjoyment of life and make The Natalie the fulfillment of your dreams!